Pure AV is a leading technology solutions provider, offering consultancy, solution design, installation, service and support to organisations across the UK. 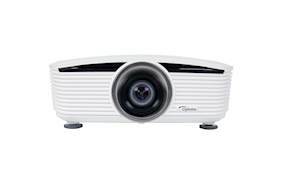 This projector was chosen due to its combination of zoom, lens shift and choice of five lenses including an off-axis short throw that could meet the exact requirements of the 360 degree projection. 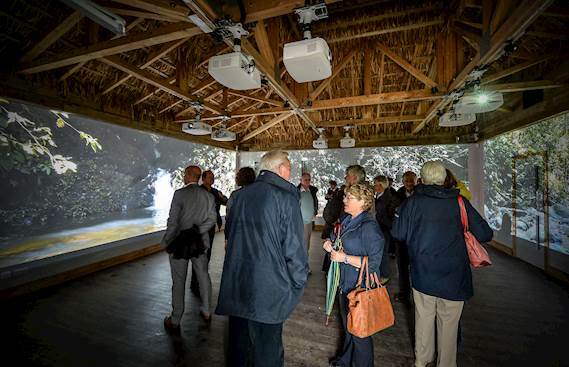 Challenge: Chester Zoo wanted to create an immersive audio visual educational experience for its Sumba School that included a 360° projection display in a square room. Solution: Using bespoke Unicol brackets, eight EH503 Optoma 1080p projectors were installed and blended to create a seamless image around all four walls. This displays authentic 360° video content, commissioned by the Zoo and captured in Sumatra, complemented with a quad surround system and Dataton’s Watchout software to manage the content. Results: The use of the sophisticated 360° projection and audio system creates a truly immersive learning environment and its flexibility has been a massive hit with the education team. Chester Zoo wanted to create an immersive audio visual educational experience for its Sumba School that included a 360° projection display in a square room. To create 360° projection with clean edge blends around the whole room would need incredibly accurate installation, so it appointed Show Systems Programmer and Consultant, Dave Lascaut, and AV experts, Pure AV, onto the project team. 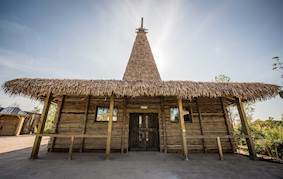 Sumba School is part of the ground breaking £40m Islands development at Chester Zoo. Home to the Zoo’s education team, the building hosts a varied programme of educational activity including workshops for local schools and colleges, curator-style talks and animated story telling for younger audiences. The specification created by Lascaut required the installation and blending of eight EH503 Optoma 1080p projectors to create a seamless image that would wrap around the four walls of the building. This bright 5,200-lumen 1080p projector produces vivid colours and pin-sharp imagery. It has powerful image blending tools with a 3-axis colour matching system and 10x lamp-power steps making it ideal for edge blending projects like this. With full support for Crestron, Extron, AMX, PJ-Link and Telnet LAN commands, the projector can be controlled and monitored remotely over a LAN. A quad surround system complements the images and completes the immersive experience. Dataton’s Watchout software manages the content and allows for live inputs from Power Point presentations, DVD players and Apple TV. On surveying the space it was clear to Pure AV’s design team that micro-adjustment of the projectors’ position would be crucial in delivering a seamless image and therefore a bespoke Unicol bracket was selected. A rack containing the Video Servers, Line Drivers, Control System and Audio Processing equipment to drive the system was built and configured by the Pure AV team off-site and delivered ready to go. HDBaseT not only allows data to be sent over a much greater distance than HDMI but can also carry HD video, audio, ethernet, power and control on a single cable. This significantly cuts down the number of cables needed for a typical installation. The screen displays authentic 360° video content commissioned by the Zoo and captured in Sumatra, but at the press of a button can display independent presentation content on each of the individual wall spaces. The use of the sophisticated 360° projection and audio system creates a truly immersive learning environment and its flexibility has been a massive hit with the education team. Ed Boyd, education officer at Chester Zoo, said: “The 360° display allows us to create a real impact as students enter the space. The ability to display different content on the walls enables us to get participants up and on their feet and engaging with content in new and exciting ways”. Martin King said: “The Pure AV team had an important part to play in the delivery of Sumba School and thanks to their work and that of consultant Dave Lascaut, we have created a really impactful space that our Education Team and visitors can engage with and truly enjoy”. He added: “We knew the integrator would be working to the tightest of margins – as little as an eighth of an inch out and a clean edge blend would not be possible. Having worked with Pure AV on projects in the past, I was confident that they would be able to deliver to the exacting requirements of the specification”. The project was made possible through the support of a significant grant from the Wolfson Foundation. Dave Lascaut has over a decade’s experience working for the world’s leading attractions and theatre companies specialising in lighting and audio design, systems integration and show control design development and programming.